Posted on Thu, Feb 23, 2012 : 9:56 a.m. So many floor plans make little sense, posing the question: "What were they thinking?" In most cases elements were added like boxes to fit into the available space. The truth is that many of these decisions were not "thought out," often resulting in cramped spaces or walls that are unfriendly for furniture. The first floor (not shown) had two bedrooms and a hall bath. This second floor also had two bedrooms and a hall bath. The upstairs was used exclusively for the master bedroom (A). The second bedroom (B) was used as a sewing room. Both closets (C & D) were used by the couple. The hall bath (E) was truly minimal and frustrating. 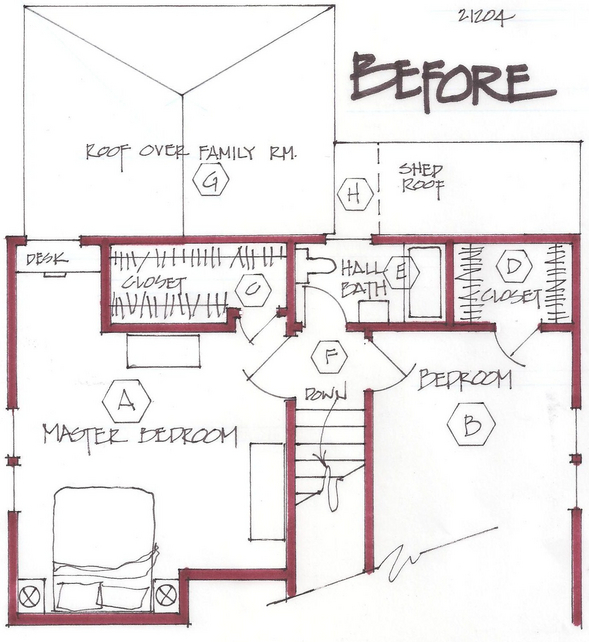 This couple wanted a better closet and bathroom for the master bedroom. 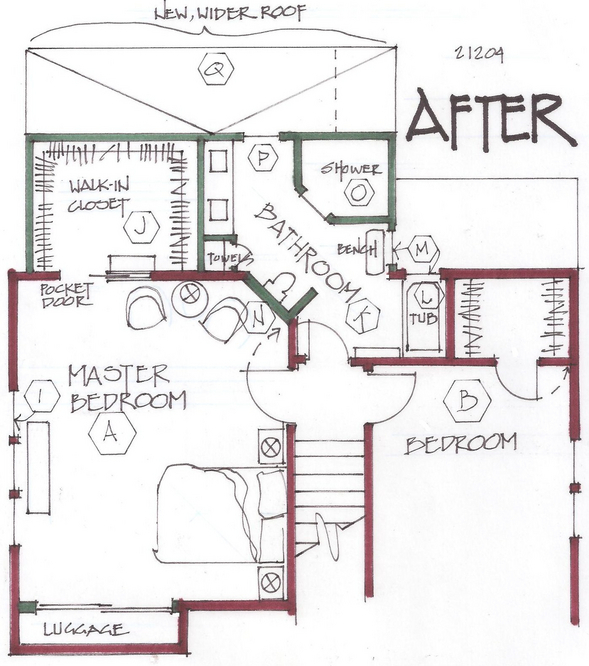 They were worried about having only a master bath and no hall bath in the event that bedroom (B) would be used as a bedroom again. They really didn't want to invest in two bathrooms, and so they directed me to make a good master bathroom, accessed from the hall (F). This is when the magic comes in —for me to find space where there was none. I couldn't make the bedrooms any smaller, so I chose to "bump out" over the one story family room (G) below, and over part of the kitchen (H) below. By taking out the master closet (C), we managed to enlarge the master bedroom (A). A window (I) was added to help balance the room. A very generous walk-in closet (J) is in the new space and is accessed by a mirrored pocket door. The hall bath (E) was expanded upon with the bump-out (K). The tub (L) was retained, and two windows (M) were added to brighten up the space. The toilet was only moved slightly, using the existing soil pipe. Should a homeowner in the future want a direct access to this bathroom, the toilet could be moved to where the bench is and a door added on the angled wall in the master bedroom. The bathroom is much larger and interesting with the introduction of angles. An oversized shower (O), with the door on an angle, continues the unique feeling. A two sink vanity is added along with a towel closet. One more window (P) pulls natural light through the bathroom. A new roof (Q) was constructed over the remainder of the family room (G). Marcia Lyon is a professional remodeling designer and freelance writer, producing projects locally and several other areas across the U.S. and Canada. Her new book on remodeling design, “The Essential Planner for Home Remodeling,” is available at www.creatingspaces.net. You may contact her at Marcia@creatingspaces.net or at 515-991-8880.